Q. IS A RUBBER MULCH PIT NECESSARY FOR A BACKYARD PLAYSET? Rubber mulch is not required. A Rubber Mulch Pit is recommended as it helps ensure that your play area is as safe as possible in the event of a fall. It also makes it very easy to mow around the area and looks great! But, we understand that not all backyard swingsets need a rubber mulch pit. The majority of our swingsets are installed right on the grass. Q. HOW DO I INSTALL A RUBBER MULCH PIT? Q. WHY RUBBER MULCH AND NOT ORGANIC MULCH? Rubber does not decompose like organic mulch, so you do not need to keep replacing it or topping it off. It is a one-time purchase, just like your trampoline or cedar swingset. It offers a substantially higher critical fall height so it makes backyard swingsets safer. Rubber does not absorb water like organic mulch or wood chips so it dries very quickly after a rain and your kids can play shortly after a summer storm. It does not attract bugs or animals and is a much cleaner product. Unlike organic mulch, it does not compact, so you know it’s always soft and cushiony. Q. WHY IS YOUR RUBBER MULCH BETTER THAN OTHER RUBBER MULCHES? We only use shredded Soft Landing Rubber Mulch, or SLRM. Most other places sell chunked rubber. While chunked rubber is okay for landscaping, it is simply not a good choice for under a playset. It has big pointy pieces that roll around making it tough to walk on with any traction, and painful to walk on bare foot. The chunked rubber usually contains a lot of fibers that will decompose making it necessary to top it off occasionally, where as our bags of shredded rubber mulch bulk bags, ONLY contain shredded rubber. Q. HOW DOES YOUR RUBBER MULCH PRICE COMPARE. Pretty well if you do the math. Many people assume the giant 2000 pound sacks of rubber are a better value because it feels like you’re buying in bulk. But when compared apples to apples, i.e. coverage amount necessary, not just weight, our rubber mulch stacks up pricewise and is definitely a better quality. When a 2000 pound sack of rubber is delivered, they usually have curbside delivery only, leaving you to figure out how to move it to your install area. Our delivery service will have manageable rubber mulch bulk bags stacked neatly in or near your desired area. We can even spread it for you for 1.50 per bag. Remember; never compare it by weight. A pound of SLRM covers more than a pound of the chunked with the fibers that compress. Never compare bag pricing unless you are comparing it to another bag that covers 2.5 cubic feet, a cheaper bag is not cheaper if you will have to buy more of them. Only compare the bottom line of what you need for your area and the best product for your application. Please feel free to visit your nearest Play N’ Learn for a sample of SLRM, or call or chat with us to request a sample to be mailed to you. Q. HOW MANY BAGS DO I NEED? Our 40 pound bags cover a tremendous 2.5 cubic feet per bag, which equates to 10 square feet at a 3” depth. See our coverage chart below. Q. DO YOUR PRESET PLAY PITS INCLUDE EVERYTHING I NEED? Q. CAN I CUSTOMIZE THE SHAPE OR SIZE? Absolutely! The preset pits shown are designed to give you the most economical shape around the corresponding cedar swingset, by cutting out the areas where no play activity is going on. But our playset experts will be happy to customize one that better suits your needs or yard if you wish. Q. HOW DO I ORDER ONE WHEN I PURCHASE MY PLAYSET? At the bottom of each playset page, the proper rubber mulch pit will be shown. Just check the box for a black or red mulch pit to add it to the cart with your set, it’s that easy! Q. CAN I ORDER A RUBBER MULCH PIT FOR MY EXISTING PLAYSET? Of course! Just select the appropriate playpit for your existing set. If you are unsure of which one you need, just give us a call or start a chat below. Q. WHY USE BENDY BORDERS? Bendy Borders contain the rubber mulch and prevent it from spreading into your yard. They are the absolute best choice for your play area. They have cushiony, rounded tops. The hardware is safely recessed into the border. They are flexible allowing you to create areas that aren’t just boring rectangles. If you have slope or choppiness in your yard they will conform to it with no digging necessary. They are very heavy which will ensure durability and sturdiness. Q. WHY ARE YOUR BAGS OF RUBBER MULCH MORE EXPENSIVE THAN SOME OTHER BAGS? Simply put, our bags cover a lot more surface area. 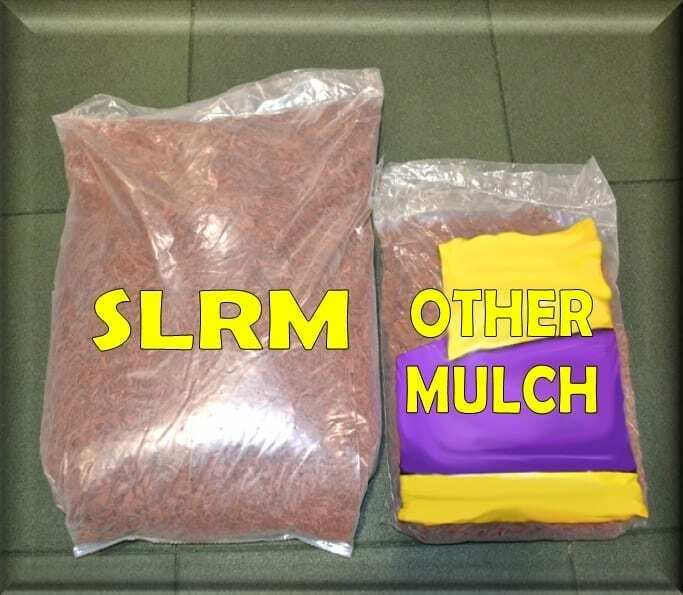 Like we mentioned before, a pound of SLRM covers more than a pound of the chunked rubber mulch with the fibers. You shouldn’t compare bag pricing by price unless you are comparing it to another bag that covers the same amount of cubic feet. If you think about it, a cheaper bag is not cheaper if you will have to buy more of them! With SLRM, you’re paying for a high quality product that will cover a lot more than some of the other bulk brands.